Buy this item and earn 1,732 ClubPoints. High Density, Multi-User, Matrix VGA/USB KVM Switch with USB 2.0 Support for Touch-Screen Monitor and CAC Reader Compatibility. The UNIMUX™ High Density VGA USB KVM Matrix Switch allows up to 4 users to individually command or simultaneously share up to 8 USB computers. 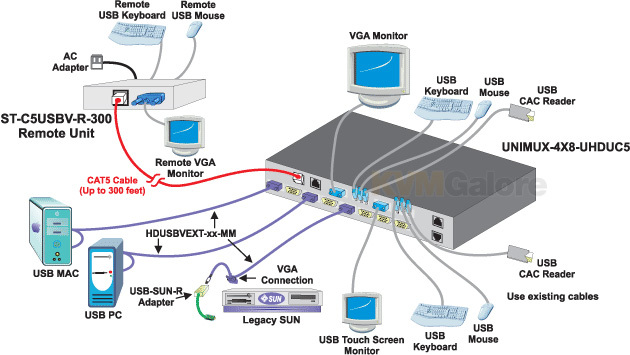 Access USB computers (PC, Sun, and Mac) using USB keyboards and mice, and VGA multiscan monitors. • Saves rack space: 1RU in height. • Features NTI's patented true autoboot USB switching – all attached computers can be booted simultaneously. • Compatible with USB computers (PC, Sun, Mac). • Support for a USB 2.0 (low/full speed) devices, in addition to keyboards and mice, such as USB touch screen monitors, interactive whiteboards, or CAC card readers. Additional USB device must be the same for each user. • Use USB 2.0 ports to connect 3M or Elo USB touch screen monitors, NEC Multisync E222W touch screen monitors, CAC card readers, SMART Board™ interactive whiteboards, SMART Podium™ interactive pen displays, or Motorola Symbol LS3408 bar code scanners. • Cascade UNIMUX switches off a single master switch to control up to 256 computers as if from one switch. • High quality steel construction. • Crisp and clear 1920 x 1200 video resolution. • Equipped with OSD, Liquid Crystal Display, RS232, and Ethernet. 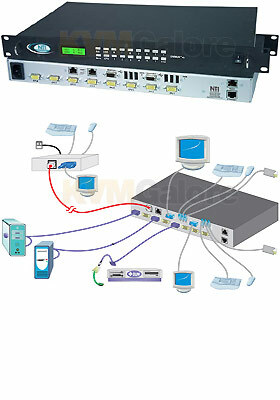 • Cabling runs are simplified with NTI's high density KVM switch cables. Listed below are additional products to consider which are compatible with 4-User UNIMUX HD, 8-Ports w/ USB 2.0. These items may be required to complete your system.